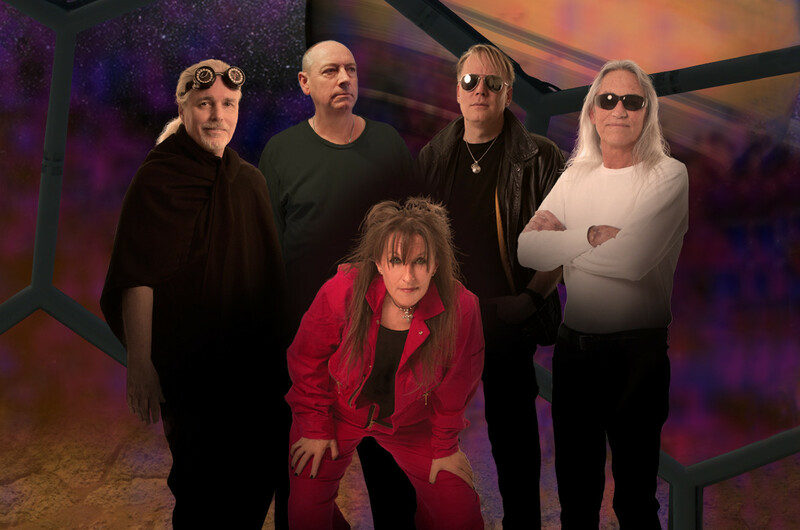 California-based five-piece Progressive Rock band, with duel vocals, symphonic keyboards, progressive guitars, driving bass and adventurous drums provide the backbone of Gekko Projekt. JoJo Razor (vocals) is a performance artist who loves complexity. She experiences the complex realm as a progressive journey in the moment of presence. After creatively starving for years in cover/tribute bands and sharing the stage with international personalities and acts she returned to the arena of the progressive where all of her skills were interfused: singing, performing, film making, visual arts, costuming, storytelling and ritual theater. The road behind her includes “VoxMaids” a progressive multimedia band and “The Dead of Winter Forest” a dark night of the soul multimedia solo performance play. The path now taken includes singing with “Gekko Projket” (L.A.), singer/songwriter with “Imager” (Oakland) and fronting the Yes tribute band “Shine Delirious” (SF Bay Area). She is also a co-creator and performer of “The After Hours Electric Prog Jam” on Cruise to the Edge for 2014 and 2015, a cruise ship that features numerous progressive bands such as Yes, Marillion and Gentle Giant. Vance Gloster (Keyboards, Stick) has produced CDs for various artists from blues to folk to jazz–including working with Alan Parsons–but progressive rock has always been his favorite. He also wrote and recorded the score for the film The First Time. In recent years he played in the progressive blues rock band WZMG and the Coot, co-producing their CD. He contributes much of the band’s material and provides lead vocals on Snow White. He was a performer on “The After Hours Electric Prog Jam” on Cruise to the Edge for 2015. His favorite keyboard sounds include Moog lead synth sounds, Hammond organ, and Fender Rhodes electric piano, and has keyboard influences from Booker T. Jones to Eddie Jobson to Cory Henry. His compositional influences include Stravinsky, John McLaughlin and Yoko Kanno. Peter Matuchniak (Guitar) is a British-born musician whose progressive style of guitar features melodic solos and graceful chording, influenced by the likes Steve Hackett (Genesis), Dave Gilmour (Pink Floyd), Andy Latimer (Camel) and Mike Oldfield. However, as a self-taught musician, he has a unique approach to composition and melody, letting sounds and textures guide his instinctive guitar work. Back in the 1980’s, he was part of the so-called British neo-progressive rock movement, with Janysium and Mach One, that was represented by Keith Goodwin (press agent for Yes and Marillion). Later he worked as a jingle writer for TV ads in India while traveling through Asia. Since moving to Southern California he has released multiple albums with Gekko Projekt and Evolve IV, as well as two solo studio albums and one live DVD. Peter Matuchniak also writes, records and mixes at his home studio. Rick Meadows (Bass) has been playing in blues and progressive rock bands in Southern California for decades. Along with Vance, he was a member of the progressive blues rock band WZMG and the Coot. Rick provides the lead vocals on North of Titan on the latest Gekko Projekt album, Reya of Titan. Alan Smith (Drums) Has played in many influential Southern California bands, including a Jethro Tull tribute band. Besides playing drums, he also provides lead vocals on Frienda on the latest Gekko Project album, Reya of Titan.